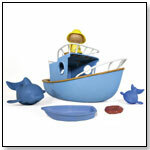 TDmonthly® - New Toys and Games: Captain Owen's Dolphin Explorer Boat from SPRIG TOYS, INC.
Join Captain Owen on the open seas! 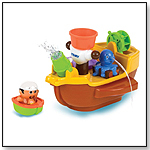 Our rugged boat playset is great for the bathtub, beach, and pool. A complete playset. It includes an 2 boats - Explorer Boat and Rescue Boat, a Life Preserver, two Dolphins - Mother and Baby, an Adventure Guide - Captain Owen, an Adventure Hat (interchangeable with other characters), and a Backpack Accessory. 2010 TOTY Award Winner.